If you’re looking for a web hosting provider that provides both personal and business web hosting solutions at a reasonable price than MyHosting Web Hosting is a solid option that should definitely be considered. MyHosting has been a web host since 1997 and offers a wide range of top of the line features that are compatible with most common requirements for websites. They are an owner operated business, so you can be assured that you’re not being forced to deal with some huge, faceless, hosting company. MyHosting is an excellent, well rounded solution for small to large sized businesses and has plenty of room for growth as your business evolves over time. When it comes to getting the most bang for your buck, you want a web hosting provider that gives you the features you need at a price that won’t put you into bankruptcy. 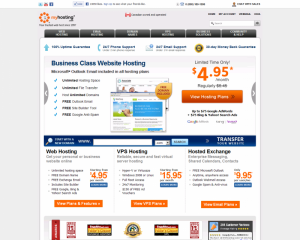 MyHosting offers a very low $4.95 per month as long as you signup for at least a full year. While this rate is not the lowest of the web hosting providers we’ve reviewed, we think you’ll have a hard time calling less than $5.00 a month overly expensive. For a full year of hosting with MyHosting, you’ll pay only $60. In terms of features, MyHosting has a wide array of tools and software platforms that cover the majority of the bases any traditional business would need. Popular tools such as MySQL, PHP, Perl, .NET, and MS SQL are all available. Unfortunately, some of the not so popular platforms such as Ruby on Rails, JSP, and DJango/Python are not available. Also, MyHosting places a limit of 3 MySQL databases per account, so those of you hoping to create more will be forced to pay additional fees. When it comes to day to day performance and reliability, MyHosting has a solid track record. Offering 99.99% uptime, you can be sure that your website will be up and running virtually all of the time. In addition, if you are not satisfied with your hosting, you can get your money back within the first 30 days. Unfortunately, unlike many other web hosting providers, MyHosting does NOT provide a money back guarantee outside the 30 days. When it comes to peace of mind, you want to be sure that your web hosting provider is there for you in case of any problems. With MyHosting, you get a dedicated 24/7 email, chat, and phone based support system. So, should you run into any problems, you can reach technical support at any time. In addition, MyHosting also offers an FAQ, Help Wiki, and Community Forum for additional sources of support. For anyone who’s not familiar with designing a website, having an easy to use system can make a big difference. With MyHosting, you get ready access to many of the web’s most popular website packages such as Drupal, Joomla, Gallery 2, and WordPress. With just a few selections, you can have your website up and running in no time. We would have liked to see more support for more obscure packages such as Plone, Ruby on Rails, DJango, and Moodle, but most users will have no need for these packages anyway. Overall, MyHosting is a very middle of the road and standard web hosting provider. They provide many of the options you’ve come to expect from a web hosting provider, but they don’t go overly out of their way to give you access to more obscure offerings. In addition, we found their nickle and dime’ing over things like the number of MySQL database you can host for free to be unnecessary in comparison to many of the other hosting providers available. In terms of Support, MyHosting is really exceptional offering you many options so you can get help when you need it. All in all, we think MyHosting Web Hosting is a solid offering for small to medium size businesses who are looking to simply setup a site and have it work correctly. For anyone looking to think outside the box with other platforms, you’ll probably want to consider an alternative provider.